Rev. Barber addresses media at Natl. Moral Monday Protest. It is a form of theological malpractice that borders on heresy when you can p-r-a-y for a president and others when they are p-r-e-y, preying on the most vulnerable, you’re violating the most sacred principles of religion. In response to Barber’s comments, the NC political media sought out responses from the state GOP on the issue, and of course they were outraged. But why didn’t that same media seek comment from the state Democratic party leadership? Usually when controversial comments are made by public officials affiliated with one party or the other, the mainstream media’s first reaction is to seek out members of that person’s political party for comment to see if they condemn them. When it's a GOP scandal, the story is the scandal. There’s no better example of this than the story of Buncombe County local yokel Don Yelton, who was made “the face” of the North Carolina GOP after inflammatory racial remarks he made on the Daily Show several years ago. Yelton was elected a local precinct chair by a vote of 2-1 (he and his wife were the “aye” votes), and this turned him into a “state GOP official” in the eyes of the national and state media who didn’t bother to do any digging whatsoever on Yelton’s storied political history simply because they were engaging in confirmation bias. As a result, the state GOP were called on by the media to condemn Yelton’s remarks, which they did. Even though he held no official position within the party whatsoever. 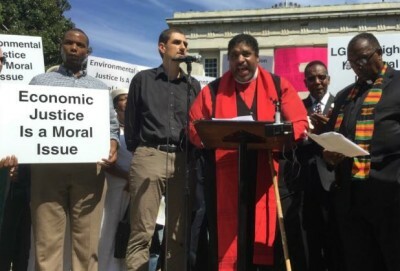 The Reverend Barber’s ties to state Democratic party leaders are much more official. In fact, he’s been their de facto head for years as the “leader” of the Moral Monday movement – which has gone national. Yet they are rarely if ever called on to answer for any of his incendiary remarks. Why? Seems like a another example of their longstanding favoritism towards Rev. Barber and the agenda of the state Democratic party. Matthew 7:1 – Judge not, lest ye be judged.